Zimbabweans watch the documentary, "Gukurahundi Genocide: 36 Years Later," during its screening in Harare, Oct. 17, 2018. A new documentary on massacres by Zimbabwe's military has led to harsh exchanges as the 1980s killings challenge a new president who preaches unity but refuses to apologize for his alleged role in one of the country's deepest wounds. 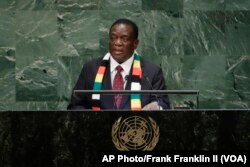 FILE - Zimbabwe's President Emmerson Mnangagwa addresses the 73rd session of the United Nations General Assembly, Sept. 26, 2018. During Operation Gukurahundi — "the early rains that blow away the chaff" in the local Shona language — a North Korean-trained brigade rampaged through the southwestern provinces of Matabeleland, leaving 10,000 to 20,000 civilians dead. That's according to a 1997 report by the Catholic Commission on Peace and Justice that drew on more than 1,000 interviews and is seen as the most authoritative account. "Most people involved in Gukurahundi are now in power. This makes them uncomfortable," added Ndebele, who said he was summoned by police before being allowed to screen the documentary in September in Bulawayo, a city where many of the atrocities occurred. "You are hired guns," barked Ibbo Mandaza, an academic who runs a nongovernmental organization that hosted the screening, referring to the seemingly pro-government youths.